Interdependence of International Relations with finance, economy, technology, research and advanced knowledge until a few years ago unimaginable, new military might introduced by innovation must be some of the crucial challenges, where also our Journal Global Policy and Governance intends to contribute opening its pages, issue after issue, to faculty, experts, testimonies, articles and relevant review of books, junior researches working papers. Global governance is a challenge of our era and us as human beings no matter where we live and what values we believe in. After a 100 years of development, international relations are so closely and tightly knit. A problem in a community might affect the life of the people in a remote part of the world and its solution might also be in the hands of these people but can’t be assumed outside the more global International Relations theories and practices approach, an interrelated already practiced at every policy decision making, economic and financial levels and first of all by the main powers. How can we manage this complex of various relations matters for our life and common future? It is the time for us to invest our wisdom and energy to make global governance work now and to give a sense to the United Nations already reduced to a zero-sum-game playing on the major emergencies and conflicts due first of all to the obsolete veto system that would be at least extended to all the 15 countries of the Security Council, being them permanent or at rotation, with the weighting of votes bringing less hypocrite the present five Jalta powers partition already 70 years ago. We are talking of the world not existing anymore. 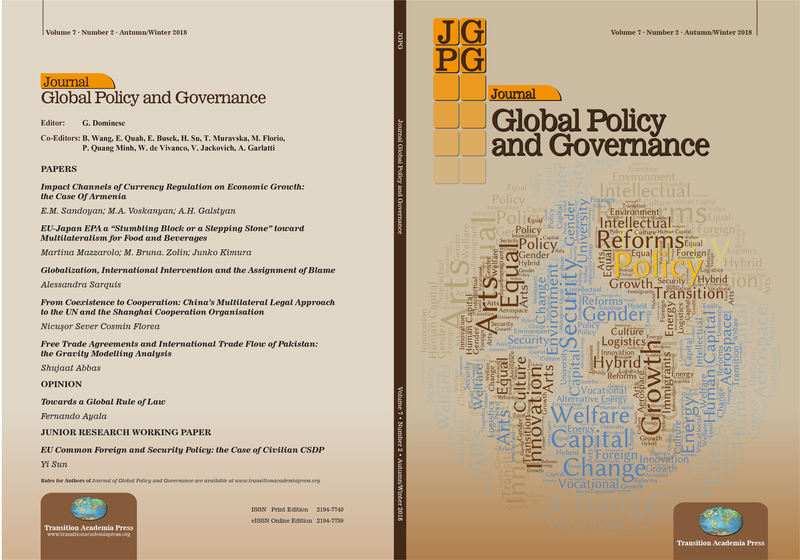 There is no simple way and framework for global governance. Global governance is a general term which means to think globally and act globally. It is complicated because problems might be local. It is complicated because problems might be also global. It is complicated because the solution of problems might be local but also in a global framework global. That is why we need to check issues case by case carefully. We need to sort out what solution is the best choice for the problem. We need to identify who should be the persons of good will taking the challenge and adding their intellectual and scientific capabilities to the human destiny. We have to take an action worldwide. Global issues are definitely the subjects of global governance. Meanwhile, global governance takes care of issues with local reasons and local solution because we believe the experience might be helpful for people living in other parts of the world. Interdependence of International Relations with finance, economy, technology, research and advanced knowledge until a few years ago unimaginable, new military might introduced by innovation must be some of the crucial challenges, where also our Journal Global Policy and Governance intends to contribute opening its pages, issue after issue, to faculty, experts, testimonies, articles and relevant review of books, junior researches working papers. But we know also that traditional conflicts would not have any perspective in the medium term and will bring to the defeat of the ones who are imagining a return to the past. We intend to embrace and reach all the possible interested colleagues and fellows around the world, as choices and strategies in all the sectors involving public and private governance, nobody excluded, are under questioning and innovative evaluation. Global world is not anymore a provocative statement, a kind of utopian return to realism and the theories dominant up to the German reunification, the end of Soviet Union and the war in the Balkans have now become obsolete by definition. Middle East, Black Sea, Eurasia, Ukraine, Baltic, Turkey have the capability to reshape the future. Even if they are now in the middle of the fire, soon the devastations and impressive mass killings will be overcome and reconstruction taking the lead in many of these countries. But why not underline the successful 30 years development and growth of China, a unique case in the last 500 years. China is the third world power, after European Union and USA, and has now similar problems we have encountered and are still facing nowadays, needs to find a political solution to reforming and giving voice to an accountability to its almost 1 billion 500 million inhabitants. We really have to rethink the International Relations and the theories of Global Governance and Policy Choices, accepting the pluralities of institutional architectures and ways to give voice and accountability to the citizens. The European Union represents a "non Statehood" institutional governance, without even a Constitution and the Sovereignty belonging to the member countries. Do you believe the EU will change its architecture established by the Treaty of Rome in the future? This is an illusion of the antagonists of the different strategies and policies that were adopted right up to the Euro and the high welfare and technologic standards already achieved, even in the face of a crisis on 2008 that from the Atlantic arrived to Europe three years later and is now affecting East Asia. By 2020 we will be out of this tunnel everywhere in the world. To add a valuable contribution to this scientific debate is our very aim and scope.